A few weeks ago I was having lunch with a friend who half-jokingly asked me if I was ready to retire yet. I half-jokingly quipped that I was well past the age of “fundable” established by Silicon Valley venture capitalists, and would therefore be relocating to Puerto Rico in the near future. Jokes aside, ageism in the technology industry is a real phenomenon, and these perceptions are unfair on two counts. First, venture capitalists with any common sense do in fact frequently fund entrepreneurs of all ages, although there are more than a few seemingly without any common sense. Secondly, productivity and age are not correlated, but productivity, health, and wealth and probably are. 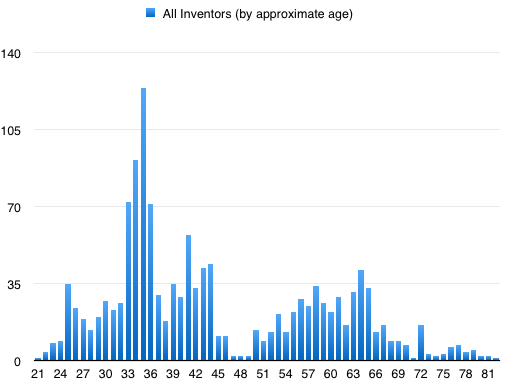 I took a wager with my friend that a cursory analysis of famous inventors would show no correlation of age to productivity. I wanted to minimize the distortions of the modern market on intellectual property, so I just took the first few off the list of famous inventors from the last century. I cannot claim that this is scientific or fully conclusive, but I do claim that someone owes me $20. 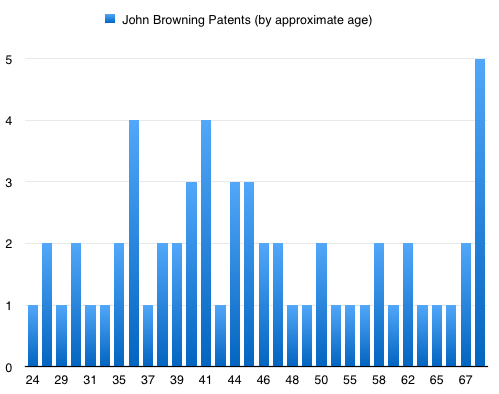 The data is actually a little difficult to find because the USPTO database is not searchable before 1976. If someone wants to do a complete analysis of the famous or prolific inventors of the last century, I would be willing to reward you with the proceeds of my $20 wager. Suffice it to say that you would be unwise to “hire young” as some people have suggested, even if you were comfortable with breaking the law. 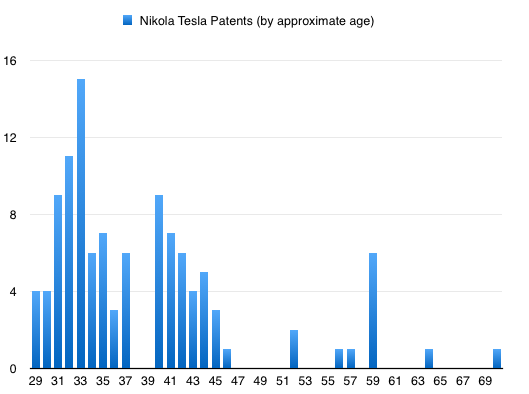 I wonder how previous experience factors in the initial age of definable productivity (patents in this case). If you do not hire young and therefore prevent high potential individuals from gaining the experience needed to recognize what is deficient and in need of fixing, will they still realize the same potential? Probably in some cases the answer is yes, but I would wager that those instances are the exceptions, not the norm. The real question might be how do you identify the “game changers” and help enable their success? Very cool analysis. Thanks for taking the time to do it and blog about it. Have always been curious about the topic. The basis for comparison is incorrect. Patents are a reflection of technology, know-how, methods, process, innovation, how to build things, and things. Silicon Valley is no longer any of those. Silicon Valley is now about media, pictures, chats, videos, and social interactions. A better comparison would be neighbors’ number of chats by age, TV viewing consumption by age, articles written by journalists by age, number of songs listened to by age, chats by kids in playground by age, etc. That’s what Silicon Valley is focused on these days. 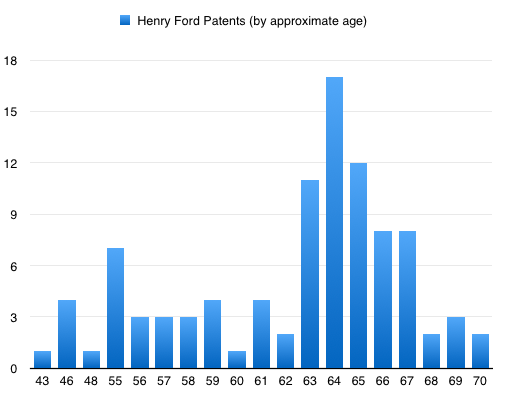 I intentionally chose an era where patents were a significant measure of productivity, as opposed to the modern Silicon Valley where legions of underlings file patents on the behalf of famous people. Your suggestion on journalists might be a good one. I think it would be interesting to look at book authors, musicians, or other where personal productivity can be readily measured. Your text implies that you found no correlation between age and productivity, but your numbers show a strong correlation. What gives? I didn’t post the spreadsheet, but the best fit OLS regression looked pretty darn flat. 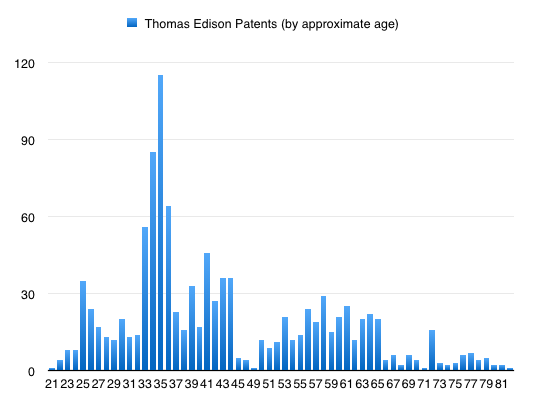 I think we can safely say that Thomas Edison is an outlier all the way around!